Is Brian Elliott a Vezina Trophy Candidate? The St. Louis Blues have become one of the NHL’s elite teams this season. While the goaltending of Jaroslav Halak was expected to propel the Blues into the upper echelon of the Western Conference, the real surprise has been the emergence of goaltender Brian Elliott. Brian Elliott was originally drafted by the Ottawa Senators in 2003. While a ninth round pick often goes overlooked, Elliott defied the odds by making the Ottawa Senators’ roster in 2008-09, playing in 31 games. He recorded a respectable record of 16-8-3, with a 2.77 goals-against-average. The next few seasons were a whirlwind for Elliott. The Sens’ play started to fail in front of him, and as a result, his play also started to decline. Eventually he was dealt to the Colorado Avalanche in 2011, the Senators so exasperated by his inconsistent play they opted to jettison him out west. After finishing the dismal 2010-11 season with the Avalanche, Elliott signed with the St. Louis Blues as a free agent. It was a signing that largely went overlooked. Elliott’s play had declined to a point where he was considered an afterthought. It was largely assumed that his career was dead and buried. Elliott proved the critics wrong in this, the 2011-12 season. 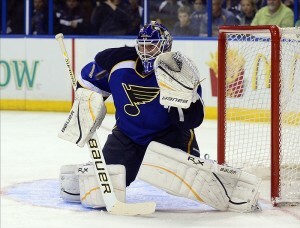 As of April 4, 2012, he has appeared in 36 games, compiling a sparkling 23-9-3 record, a stat that includes 9 shutouts. He carries a 1.48 goals-against-average and an absolutely spectacular .943 save percentage. Statistics worthy of being considered the best goaltender of the NHL? If they aren’t, one would be hard pressed to determine what a goalie would do to be considered among the elite. Could anyone imagine Patrick Roy carrying these stats and not winning the Vezina trophy? The Vezina trophy is the award given to the goalie who is judged to be the best at their position. Elliott leads the league in both goals-against-average and save percentage. He ranks second with nine shutouts. One might argue that he’s only played in thirty-six games, but the numbers don’t lie. Brian Elliott has been absolutely spectacular this season, and is one of the big reasons the Blues are talked about as Stanley Cup contenders. Halak is the number one starter in St. Louis, but the Blues have a great problem to have…two topnotch goaltenders they can rely on. Elliott has resurrected his career, and only time will tell if it leads to hockey’s holy grail…the Stanley Cup.